To become a great fighter, one must take on on comers in many sizes, forms, and shapes! From Virtua Fighter, the world's first 3D fighting game released back in 1993, comes a Figma of Sarah Bryant! 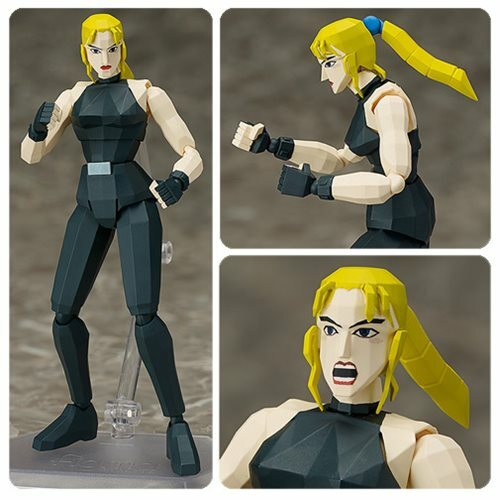 The Figma is designed to recreate the look of Sarah Bryant from the original Virtual Fighter game! You can pose her in various classic attacks including her somersault kick. Keep this Figma by your side and remember the good old days at the arcade! Using the smooth yet posable joints of Figma, you can act out a variety of different scenes. A flexible plastic is used for important areas, allowing proportions to be kept without compromising posability. Sarah Bryant comes with both a standard expression as well as a shouting expression for her victory pose. A large variety of interchangeable hand parts are included to recreate various moves. An articulated Figma stand is included, which allows various poses to be taken. Sarah Bryant is made of PVC and ABS and stands slightly over 5 3/4-inches tall. Virtua Fighter is a series of 3D competitive fighting games created by Sega studio AM2 and designer Yu Suzuki in 1993, and received four main sequels since. The first game is widely recognized as the first 3D fighting game ever released. Ages 15 and up.